One challenge as a small independent iOS developer is keeping up with evolving hardware. Some testing can be done in the iOS Simulator, but to see how an app truly behaves, it is important to develop and test on actual devices. 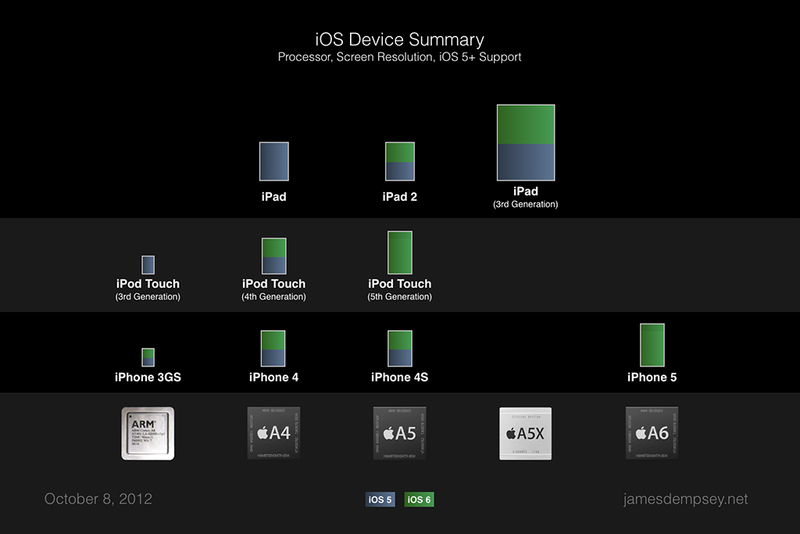 I created this summary chart as a way to visualize a few key iOS device properties. This has helped me decide which mix of devices I use to get reasonable coverage for development and testing. I’ve found it useful and hope others will also. 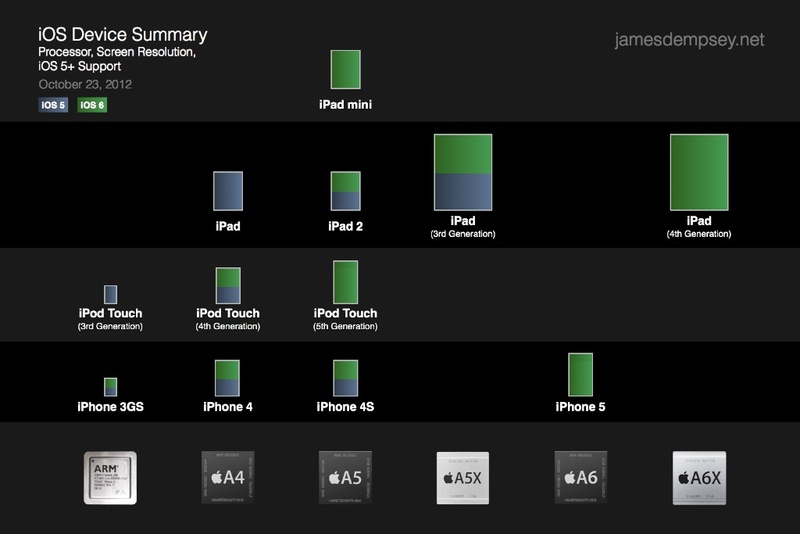 The key device properties represented are processor, screen resolution and supported iOS versions. I have two workhorse iPod touch devices. One runs iOS 5, the other iOS 6. 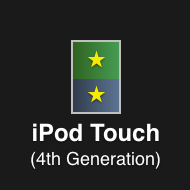 On my copy of the chart, I use a star to indicate that I have a particular device running a particular iOS version. This makes it easy to see at a glance what coverage I have across all three properties. The devices are organized primarily by processor. Each processor represents a system on chip containing both CPU and GPU, making it a reasonable indicator of system performance. I tend to develop on devices with slower processors, to ensure code performs well across all devices. The rectangle for each device is a scaled version of its screen resolution, preserving aspect ratio and relative size to other devices. Note that this represents the number of pixels, not the physical screen size. This is why the rectangle for an iPhone 4 with a retina display (960 x 640) is just a little smaller than rectangle for the iPad (1024 x 768). Supported iOS versions are indicated by color inside the rectangle for each device. This summary only includes iOS 5 and later. Since system changes that impact your app can happen between releases, it is important to test on all the OS versions you support. Additionally, because reverting a device to a previous iOS version is not officially supported, it is also important to track which of your devices are running which iOS version. You want to avoid, for example, accidentally upgrading your only iOS 5 device. Update: I’ve gotten a number of requests for a printer-ready version of the chart with a white background. I’ve added versions for color and black & white printers below. Update 2: Updated links below. You can download the most recent version of the summary, or the version that originally appeared with this post.